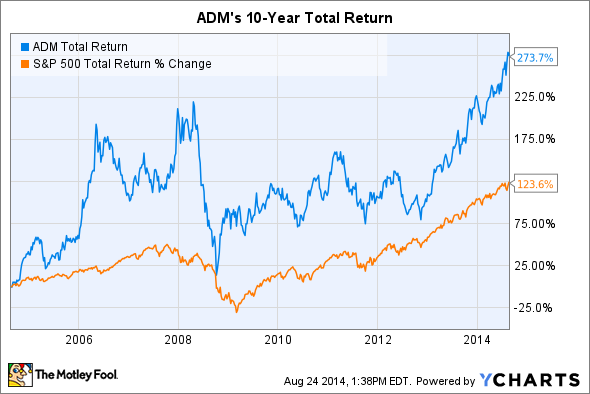 A few reasons Archer Daniels Midland's stock could rise in the coming months and years. Agriculture was invented over 10,000 years ago, and the technology has remained a critically important pillar of modern society. So It should be no surprise that the largest, most efficient agricultural products companies are capable of outperforming the market year after year and over the long haul. When dividends are included, renewable products company Archer Daniels Midland (NYSE:ADM) has outrun the S&P 500 by roughly 150% in the last 10 years by mastering the ethanol, grain, and oilseed industries. ADM Total Return Price data by YCharts. There are many reasons why shares of the nation's largest ethanol producer could go up or down in any market period. While we'll discuss some of the headwinds facing the company's core businesses in an upcoming article, here are three reasons Archer Daniels Midland's stock could rise in the coming months and years. While agriculture has certainly come a long, long way over the millennia, it remains a generally inefficient way to tap biology to produce food, chemicals, and renewable products. New technologies enabled by synthetic biology and tissue engineering (arguably falling under the synthetic biology umbrella) are about to move food production out of the field and into much more efficient platforms. Such a future is inevitable, and Archer Daniels Midland has been wisely investing heavily in it. In addition to offering new products to customers and reeling in new accounts, Archer Daniels Midland's investments in synthetic biology will add tremendous value to its vast network of basic agricultural raw materials, which are subject to volatile commodity markets. Renewable oils manufacturer Solazyme (NASDAQ:TVIA) is monetizing the company's fermentation facility in Clinton, Iowa, and turning raw corn into everything from food ingredients to jet fuel to textile lubricants. While Archer Daniels Midland also receives a small licensing fee each year, the long-term value that Solazyme could create globally for the agricultural products company is worth the up-front investment. Solazyme isn't the only company leveraging the agricultural raw materials of Archer Daniels Midland. A recent partnership with Synthetic Genomics will produce omega-3 DHA, not in fish, but in heterotrophic algae consuming sugars, for use in food, beverage, nutraceutical, and animal feed markets. The collaboration is a small step toward what could be a valuable partnership in nutritional ingredients. Similar to how the company saw the opportunity in a fledgling ethanol industry 10 years ago and became the top producer, Archer Daniels Midland is determined to become a leader in enabling new biotechnology platforms. The $3.05 billion acquisition of flavor, fragrance, and specialty ingredient leader WILD Flavors will complement Archer Daniels Midland's reach in serving current and new food and beverage customers. By focusing on developing food products that optimize desired characteristics (more fiber, protein, and taste) and minimize undesired characteristics (less sugar, fat, and sodium), the new WILD Flavors and Specialty Ingredients business will cement its position in a fast-growing sector of the food industry. It was a great deal in monetary terms, too. The acquisition price represents a P/E of 14.1 and offers high single-digit revenue growth, mid-teens margins, and low volatility. The new business unit will become an instant leader in the field and is expected to notch combined revenue of $2.5 billion in 2014. It's also uniquely positioned to take advantage of novel biology tools that are revolutionizing flavors and fragrances. In other words, it was a very low-risk acquisition that comes with great long-term upside for Archer Daniels Midland shareholders. Having eyes on the future doesn't mean management is neglecting the businesses that catapulted Archer Daniels Midland to its leadership position. The company has insisted on being part of Brazil's agricultural awakening, which has paid off to date. It owns the largest biodiesel facility in the country, and operates four soy processing plants, four fertilizer blending facilities, a cocoa processing plant, and more. That may be an impressive collection of Brazilian assets, but the growth is far from over. The company recently opened a new export terminal in Brazil for transporting grains and renewable products to global markets. It leverages billions of dollars of other investments in rail, truck, and barge transportation in the country. While it sports an export capacity of 1.5 million metric tons today, projects are under way to expand output to 6 million metric tons by 2016. As Brazil's agricultural value to the world increases, so, too, will that of Archer Daniels Midland. Archer Daniels Midland is a global leader in agribusiness that is investing heavily in its future. That includes diversifying into high-value, high-margin renewable products that build on the company's expertise in fermentation technologies and agricultural raw materials logistics. Will these help Archer Daniels Midland's stock rise? Perhaps, but investors will want to understand the obstacles facing the company, too, which we'll consider in an upcoming article.